Lafeber Garden Veggies Nutri-Berries because birds know what's good for them. Birds know a good thing when they see it, touch it and taste it. Garden Veggie Nutri-Berries are chock full of good things for your bird. Wholesome, inviting vegetables like carrots, green peas, broccoli and corn. Perfect for Amazons, African Greys all the way up to Macaws. 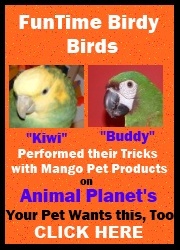 However, can be broken into smaller pieces and given to Parakeets and Cockatiels and all similar sized birds.